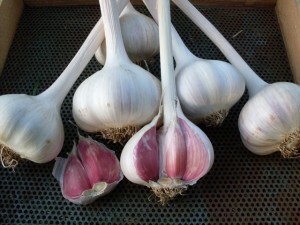 Romanian Red garlic is a popular Porcelain cultivar known for its high allicin content. Photo courtesy of AdaptiveSeeds.com. Romanian Red is a Porcelain cultivar that is known for being one of the more hardy and colorful Porcelains. As the name would suggest, it came from Romania to the U.S. where it was originally cultivated in the Pacific Northwest. Its other claim to fame is that has one of the highest percentages of allicin of any type of garlic, a key component in garlic’s health benefits. Similar to Music and Rosewood, Romanian Red is a vigorous grower that shakes off most diseases and can tolerate tough growing conditions. It produces large bulbs and cloves, making it a favorite with chefs as there’s more clove to work with and less peeling involved. 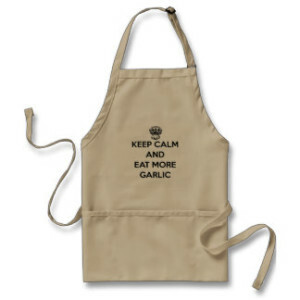 When eaten raw it has some heat and strong flavor — a challenge for those eating raw garlic for health benefits who seek out Romanian Red due to its very high allicin content. Unlike many of its paler Porcelain relatives, Romanian Red can have vivid red cloves depending on growing conditions. It can produce as few as four large cloves, making it a challenge to grow commercially due to having keep back a significant percentage of cloves for the next growing season.